There is no end to the overlooked corners of Walt Disney World just waiting to be explored. Many of them guests walk by each day without giving the little moments and hidden histories that are presented all around them. The facades of the Streets of America in Disney’s Hollywood Studios is an area rich with stories to be told and uncovered, especially for those guests willing to do a little window shopping. 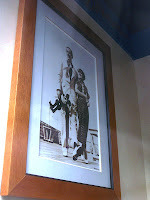 One such window, belonging to Venture Travel Services, features a photograph of a very famous duo, or rather trio, hanging on its wall. The photo is of Walt Disney and his beloved Lillian Disney. While he holds his bride with one arm, his other is filled with a stuffed Mickey Mouse (was there ever a better metaphor for the man who created so much?) The photograph was taken aboard the luxury Italian cruise liner, The Rex, in 1934. The photo itself has been a beacon for the Disney Cruise Lines since the first two ships, the Disney Magic and Disney Wonder, were commissioned in 1995 with the goal of bringing the elegance and rich detail of the stately liners of the early 20th century to the modern day. It is also so indelible an image of Walt and his balance of family and creation that it graced the cover of The Walt Disney Family Museum’s first book, The Man, The Magic, The Memories, in 2009. There is much that can and has been said about Walt Disney and his life in and away from the spotlight of Hollywood. It is reasonable to believe that just as much has been compiled about the history and stories of Walt Disney World. Here, in a small picture, in a faux shop window of Disney’s Hollywood Studios, these two worlds collide simply and with little notice. It’s another one of those minute details that makes all the difference! I always love seeing this picture when I'm on the ship. It's such a romantic pose and I always wonder what Walt would think of these cruise ships bearing his name.